Indian Gooseberry / Nellikai /Amla /Usirkaya is a fruit in India which is famous for its health benefits. It is very rich in vitamin C ,Calcium, phosphorus, iron, carotene and Vitamin B complex.Amla promotes healthy skin and hair ,Flush out toxins .It is also a natural antioxidant, and has anti-aging and anti-stress properties. It improves food absorption ,Balance stomach acid levels , Support liver function , Improve heart health , Fortify the lungs , Fight free radicals that cause ageing and diseases like cancer and heart problems , Improve fertility , Regulate the urinary system , Promote eye health and is supposed to be good for people with diabetes. benefits and it leaves a nice sweet aftertaste which many people enjoy. That's why its find in many Indian Kitchens . 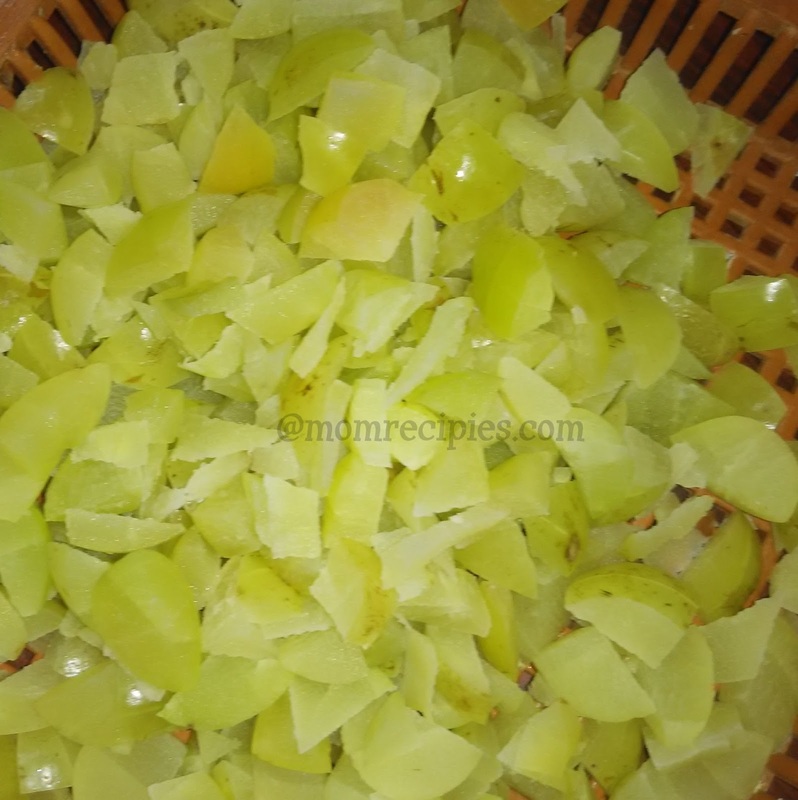 In winters amla is available in plenty.So people make Gooseberry Pickles , gooseberry chutney, gooseberry pachadi, gooseberry dal ,gooseberry rice ,gooseberry lemonade , gooseberry snacks ,gosseberry juice ,amala murraba, amala supari ,amala candy etc. Children who do not like to eat Amla enjoy eating Amla candy or Namkeen Amla happily. Eating Amla various forms regularly will help to maintain good health. Now there are three types of Candy which you can make. One being sweet ones ,Namkeen ones and another being Khatta ones. 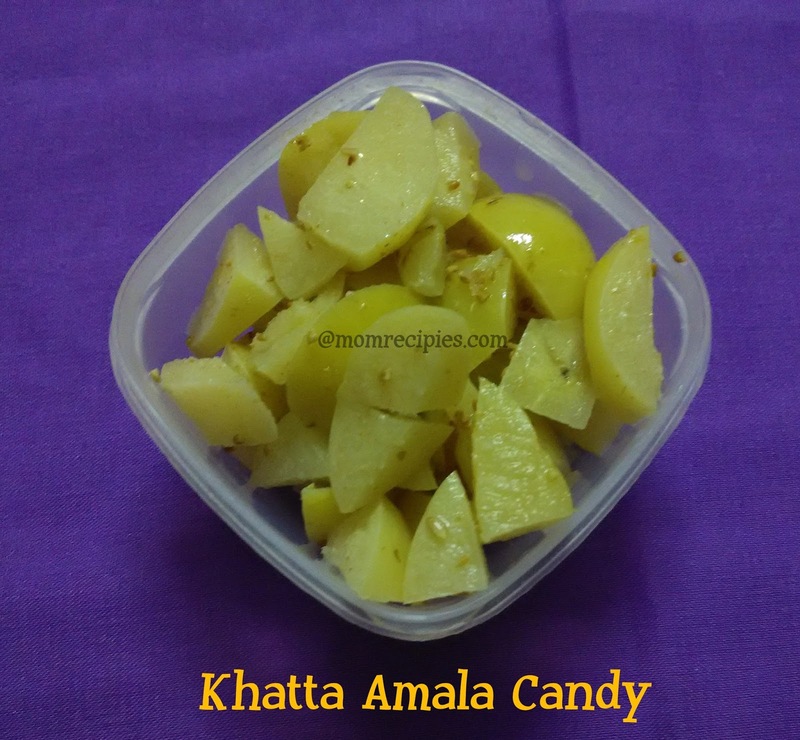 I personally love this Khatta Amla Candy. 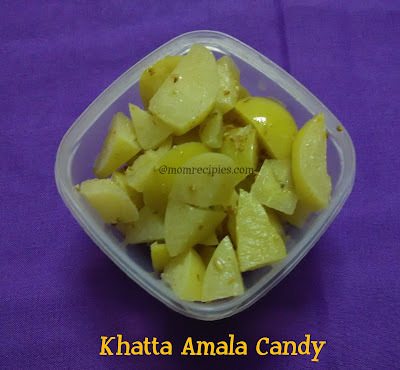 These are instant to make and it is perfect and delicious for people who love to eat Khatta. With just 3-4 ingredients you can make it in a jiffy.It improves Appetite. •Wash the amlas well. Wipe them thoroughly with a dry cloth.They should not be wet. • Toss the slices with lemon juice, salt and Jeera Powder. • Then transfer it into a clean sterilized bottle or air tight container and refrigerate. •.You can enjoy them straight away. Mind it, these are really tangy in taste but yummy. • This Khatta Amala will stay good for a month when refrigerated. •You can place them under the sun and let it sun-dried. •Once sun-dried, store them in a airtight container in a cool place.